Quilts A Lot has a couple of tutorials to make pincushions. The biscornu and a pinwheel pincushion look fairly quick to whip up. Goody-Goody has a freebie ladybug pincushion to grab here. 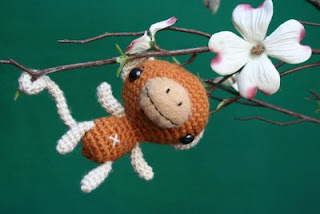 Lavinia has this cute little monkey that would whip up really quickly for you experienced crocheters. Kelly over at I Have A Notion has a great tutorial to make luggage bag tags....take a look at how easy she makes it look. There are a lot of different links to be found at Crafty Links. I haven't tried any of these in particular so if you find something on here that you have done and think its worthwhile please let me know so I can put it up as a separate link. Homeberries has some free prim stitcheries to grab for us prim lovers. Joy has a quilted zippered toiletry bag tutorial which is very clear to follow. Take a look over at Joys Patch to make it. For a short time Robyn has a great Owl freebie to grab....you can download the PDF for the pattern and tutorial...she has made it all so easy....I love it. Andrea Zuills has a free Owl stitchery that is soooo cute...definately something I will have to do up soon. Yes another tote bag tutorial but I like the fabrics in this one...so I think I need some...dont you...LOL...jump over to Imagine Fabric Blog and take a look at this tote bag. Little House Primitives have a lovely prim bunny freebie to grab here. 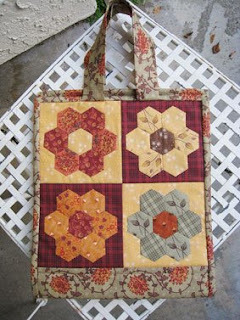 Connecting Threads has a nice easy sewing caddy to make up using hexagons that are paper pieced on the front. Definately a must do. More free graphics can be grabbed over at Penniwigs. Just to remind you that there are lots of great free blog backgrounds, blinkies etc out there. Another freebie blog I just came across is Daisy Gray Design. Mandie over at A Life In The Craft Lane has a heap of graphics, buttons and printables to grab...lots of nice prim ones too....well done to Mandie. A great tutorial for the "quilt as you go" method. I really want to try this soon as quilting on a domestic machine really gets difficult with large quilts. 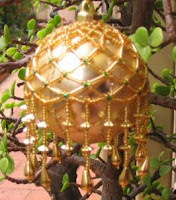 For anybody out there who wants to learn to bead here is a terrific tutorial to bead a bauble...what great pressies or deocrations for the Christmas Tree. Make you own Fabric labels following this simple tutorial. 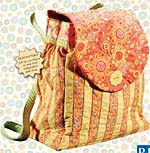 P&B Textiles have a few freebies...I like the cute backpack. There are quilts and a hat pincushion. Go grab a few. Janome has a lot of freebies to take adavantage of. I noticed a nice handbag called "Perfect Purse" which I have downloaded the pattern. There was also fabric baskets to use for storing your bits and bobs. Take a look around and if you see anything you like let me know so I can point it out on this post. The Honeysuckle Tree has a heap of cross-stitch freebies to grab. For a nifty zippered boxy pouch tutorial jump over to Projects By Jane. This would be a good pencil case I think. 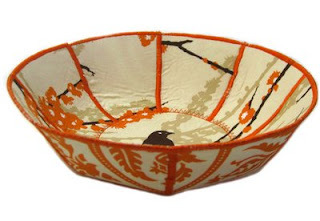 Imagine Fabric Blog has a great tutorial for a fabric bowl....this looks really easy to make and another one I must try soon. Sweetpeas Primitives has a great prim pattern called Old Glory Stocking..go grab it now prim lovers. Kim from Prims by Kim has another great prim bunny to grab....for all those prim lovers go have a look and download it quick. 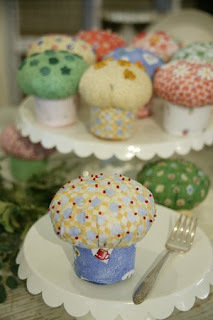 Better Homes and Gardens have pincushion trio to grab...we could whip these up pretty easily. There is a really cool dog called Baxter and a frog applique pattern over at Amy Bradley designs to grab. What a great way to use your junk mail after you have sussed out the bargains of course...lol...you could also use cheap gift wrapping paper to make these great gift bags. This Free Quilt Pattern list has many, many quilts to offer. Some very cute printables, paperdolls and more over at Tricia-Rennea Art's blog.